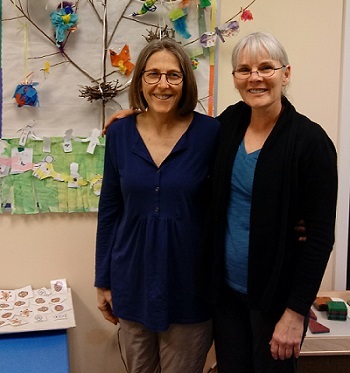 Dr. Kathy Ryan and Denise Powers co-lead the Circle Preschool Program, a trauma-informed therapeutic preschool. In school year 2015-2016, public preschools in Virginia made 318 suspensions to 167 students, according to “Suspended Progress,” a Legal Aide Justice Center report that cited Virginia Department of Education data. Many suspensions likely resulted from a lack of resources available to public preschool providers to deal with children’s negative behaviors. Nevertheless, we know this kind of exclusionary discipline can be harmful to young children, often further jeopardizing the very children who are most in need of additional support and services. Therefore, we applauded the January 2018 decision of the Virginia Board of Education to approve guidelines to reduce suspension and expulsion in public preschool. We know trauma underlies the poor behavior that leads to the suspension or expulsion of some preschoolers. As part of the Greater Richmond Trauma-Informed Community Network (TICN), a 175-member-strong collective-impact group spearheaded by Greater Richmond Stop Child Abuse Now (SCAN), we have been working to mitigate childhood trauma. While SCAN has taken the lead in developing and disseminating trauma-informed best practices, we have focused our efforts on advocating for trauma-informed policies and practices on the state level. SCAN launched its Circle Preschool Program in St. James Episcopal Church at 1205 W. Franklin St., Richmond, Va., in February 2011 to fill a gap identified by a SCAN-administered assessment into Richmond-area preschool expulsions. The assessment showed many kids were expelled for exhibiting aggressive, inappropriate behaviors that often resulted from unaddressed trauma. Circle Preschool provides trauma-informed services to preschoolers and their parents/caregivers and gives them an opportunity to heal. During our after-hours visit to Circle Preschool, we met with clinical coordinator Dr. Kathy Ryan and lead early childhood specialist Denise Powers in what looked like a fairly typical preschool classroom, full of children’s artwork, books, toys, and child-size tables and chairs. But we soon learned the Circle Preschool classroom is anything but typical during its operating hours. For starters, the classroom never has more than eight children at a time. In addition to Kathy, who has a Ph.D. in clinical social work, and Denise, who has a master’s in early childhood special education, the preschool has a full-time therapeutic aide and two part-time aides. An occupational therapist spends two hours a week at the preschool. Such an unusually high ratio of highly trained, trauma-informed staff to children ensures children get the individual attention they need to learn how to cope with their trauma and eventually integrate successfully into a mainstream kindergarten classroom. And that can be slow going. Most children attend Circle Preschool for two years to give them the time they need to unlearn negative behaviors and thought processes and develop resilience. Before they start elementary school, Kathy and Denise try to meet with each child’s kindergarten teacher to ensure a smooth transition and discuss an individual education plan if one is needed. “Our program focuses on the three Rs: regulate, relate, and reason,” Kathy said. “Take the second R: A big part of developing safe relationships and the capacity to relate to others is understanding the components of positive, secure attachment. We help these little ones learn there are safe people in this world. Kathy checks in with the children’s caregivers every morning, holds caregiver group meetings once or twice a month, and meets individually with each caregiver every other week. Such a strong emphasis on caregiver engagement is consistent with SCAN’s belief that the most powerful antidote to adverse childhood experiences (ACEs) is parental/caregiver buffering. In addition to this focus on developing safe relationships, Kathy shared with us an example of how she worked with a four-year-old child who needed help with the first R: regulating his behavior. The child had experienced repeated starvation and abandonment in his first year of life. As a result, he displayed aggressive behavior toward other children, making it impossible for him to remain in a typical preschool setting. He had well-developed motor skills and loved playing with balls, but he couldn’t play successfully with other children. “At Circle Preschool, he was given the opportunity to develop relationships with adults who didn’t retaliate for his misbehavior,” Kathy told us. “We often started the day by having him throw a large exercise ball back and forth with the teacher, thereby utilizing his adeptness and interests to engage him in a repetitive, rhythmic, and relationally safe activity. We used other sensory motor activities to help him build his ability to tolerate frustration and develop the social skills he needed to function in a school environment. 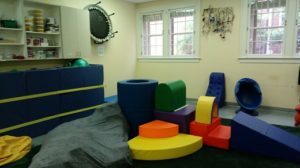 Next Kathy and Denise ushered us into Circle Preschool’s sensory room, which is adjacent to their preschool classroom and filled with large, vinyl-covered foam manipulatives. We realized from Kathy’s explanation that the sensory room helps children with the third R: reason. Circle Preschool, with its highly trained staff and innovative resources like the sensory room, shines as a best-practices model for developing resilience in young children who have experienced trauma. But scaling up Circle Preschool’s exact model could be challenging and would almost certainly involve some public funding, given the large number of children who could benefit from such an individualized program. Many of the program’s strategies are applicable in other settings, however. Through her work on a trauma-informed school committee, Denise offers her insights on the importance of a low teacher-to-child ratio, trauma-informed teacher preparation, and necessary school supplies. Both Denise and Kathy share their training and strategies with teachers, social workers, and counselors at schools with a large population of kids affected by trauma. Require professionals working in early childhood education and mental health treatment to be trained in developmentally appropriate and trauma-informed practice for classroom and clinical settings. State-supported professional development opportunities should include trauma-informed practice. Explore funding options through Medicaid for young children to receive mental health treatment in educational settings. Ask state policymakers to prioritize adding support personnel, including licensed mental health professionals, to educational settings. Engage parents/caregivers regularly in educational and clinical settings, recognizing that prevention starts with parents/caregivers. Consider having Medicaid funding follow the child and the parent, rather than only the child, is as usually the case now.